This project was to support tribal women, to help them understand how to care for themselves and their children, through low cost nutrition and immunizations. It was done in the Darbha block at Bastar District. Many health issues were identified, particularly anemia and malnutrition. Eight staff members, including a qualified nurse, were engaged in this project. It was noted that the major problem in this area was malnutrition among children and among pregnant and lactating mothers. A major concern is a lack of knowledge about diet. Many families have very limited diets with low nutritional content. Mothers are anemic, children are malnourished and the general health of the family is poor. Awareness classes were given to the families on the positive effects of dietary supplements to improve overall health. About 260 mothers benefitted from this program. A total of 10 training sessions were conducted. In addition, health camps were conducted in 10 villages. About 800 people took part. We were able to detect anemia in pregnant women, along with some skin diseases, high blood pressure, pneumonia, malaria and tuberculosis. A doctor from the government’s medical college came to assist and give classes. Most of the families, we learned, were following the wrong customs and beliefs about the kinds of foods pregnant women should eat. (An example: due to some local customs, pregnant women are often not allowed to appear before others and are often forced to eat less.) The awareness programs helped them to understand the importance of eating well, especially when pregnant or lactating. In villages, mothers often will decline to nurse their newborn children, because of a mistaken belief it is unhealthy. Classes were organized to correct that misunderstanding and promote correct feeding practices from the first day of birth. We remain grateful to all who have supported our important efforts in India and elsewhere, as we work to help some of the poorest in our world live healthier and happier lives — giving dignity and hope to so many who have only known hardship. Thank you and God bless you! At 44, Bishop Milan Lach is the fifth bishop of the Byzantine Ruthenian Eparchy of Parma and the youngest bishop to head a diocese in North America. He also is the third-youngest Eastern Catholic bishop to head a diocese and the first foreign-born bishop for an eparchy that comprises 12 states in the Midwest. A native of Slovakia, Bishop Lach is among about a dozen bishops from other countries that Pope Francis has appointed to the United States. He was enthroned recently as Parma’s bishop during a Divine Liturgy at the Cathedral of St. John the Baptist, after having served as its apostolic administrator since 24 June 2017. He succeeds Bishop John M. Kudrick, who resigned in May 2016. Bishop Lach, who is a Jesuit, has visited almost every parish and mission of the eparchy since his arrival to the United States last summer and has established pastoral priorities that include youth, evangelization, and parish reorganization. “After the fall of communism, we immediately turned to the Greek Catholic Church in America for material needs, to build churches again. We were liquidated for 18 years (under communism),” the 60-year-old prelate told Horizons, newspaper of the Byzantine Catholic Eparchy of Parma. But now, with the Slovak Eastern Catholic Church strongly re-established, there may be an opportunity to return the favor, he said. Bishop Chautur, who is a Redemptorist, said he attended the enthronement because he realized the importance of maintaining a connection between the Byzantine Catholic churches in the United States and Europe. “There are people who came (to the United States) 10 years ago or 100 years ago, and they still carry within them the Gospel they received from their forefathers,” he said. At the same time, he acknowledged the mission of the Byzantine Catholic Church in the U.S. is to minister and to be open to the diversity in American society. Bishop Chautur, who ordained Bishop Lach a deacon in 2000 and a priest a year later, was one of three European bishops at the enthronement. The other concelebrating Catholic bishops included Bishop Kudrick; Bishop Kurt R. Burnette of the Byzantine Eparchy of Passaic, New Jersey; Bishop John S. Pazak of Byzantine Eparchy Phoenix, Bishop Bohdan Danylo of the Ukrainian Eparchy of St. Josaphat, also based in Parma; Bishop Nelson J. Perez of the Latin-rite Diocese of Cleveland; Auxiliary Bishop Neal J. Buckon of the U.S. Archdiocese for the Military Services; Ruthenian Bishop Milan Sasik of Mukachevo, Ukraine; and Bishop Abel Socska of Nyiregyhaza, Hungary. Archbishop Christophe Pierre, apostolic nuncio to the United States, presided at the enthronement, attended by 400 people. The liturgy also was livestreamed. He read the letter of the pope appointing Bishop Lach to Parma, as well as a message from the prefect of the Vatican Congregation for Eastern Churches, Cardinal Leonardo Sandri. At the end of liturgy, Bishop Sasik presented Bishop Lach with an icon of Blessed Theodore Romzha, the Ruthenian bishop of Mukachevo who was martyred by the communists in the 20th century. “I would like to express to the Holy Father my gratitude for his confidence in me as bishop of Parma. I will try my best to be the successor of the Apostles, to govern and serve,” Bishop Lach said at the end of the liturgy. Bishop Lach told Horizons he intends to develop action plans in various areas of pastoral ministry and eparchial management to develop a more vibrant church. His priorities include the “liturgy, the sacraments, especially the Eucharist and confession,” which are “part of our Eastern theology,” he said. He underlined the need to offer more catechesis and faith formation to the faithful, and to nurture priestly vocations. Due to the current priest shortage in the eparchy, Bishop Lach has been inviting priests from Slovakia to come and minister. Two Slovak priests are currently undergoing the visa application process; one of them is expected to arrive this fall. Bishop Lach said the recruitment of Slovak priests is a short-term measure to try to meet the urgent need for priests: Two priests retired this past year and at least another four are expected to retire in the next 12 months. He said he hopes prospective vocations to the priesthood will be nurtured and there will be American candidates for seminary soon. The eparchy currently has two men in seminary formation and a third who will be ordained a subdeacon in August. Bishop Lach recently created an eparchial youth commission to try to jump-start more youth ministry efforts. The bishop also said he will consider reorganizing parishes to shift already limited resources, both pastoral and financial, to support the new missions and prayer communities that have developed in the western part of the eparchy. “Perhaps we will have fewer parishes, but they will be more open (to welcoming others) and more vibrant,” he said. He said there is an urgent need to get the eparchy in stronger financial shape, which includes reducing costs across the board, and he has already reached out to the neighboring Latin-rite Catholic dioceses of Cleveland and Youngstown, Ohio, to share resources. Read more about the Ruthenian Catholic Church at this link. The upcoming synod for the Iraqi Chaldean Catholic Church in Baghdad in August is expected to discuss issues vital for the church’s future both in Iraq and among its diaspora community. Chaldean Archbishop Yousif Thomas Mirkis of Kirkuk, Iraq, told Catholic News Service that the clergymen also will discuss during meetings from 7-13 August the election of new bishops as several Iraqi clergy are nearing retirement age. Proposals will be made for potential candidates. Liturgical discussions will focus on the new translation of the Mass and developments to “adapt the Mass to the new communities living in the diaspora,” he said of Chaldeans now found in Australia, Canada, France and the United States. The role of the deacon in Mass and the sacraments as well as the use of liturgical music are on the agenda as well. Archbishop Mirkis said the situation of each Chaldean Catholic diocese in the Middle East and abroad will be examined. The Chaldean leaders are seeking ways to augment the spiritual formation of the Chaldean community to increase its vibrancy and vitality in the face of challenges, he explained. 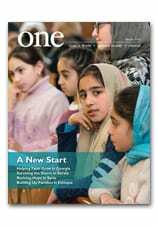 Read more about the Chaldean Catholic Church in this profile from ONE.